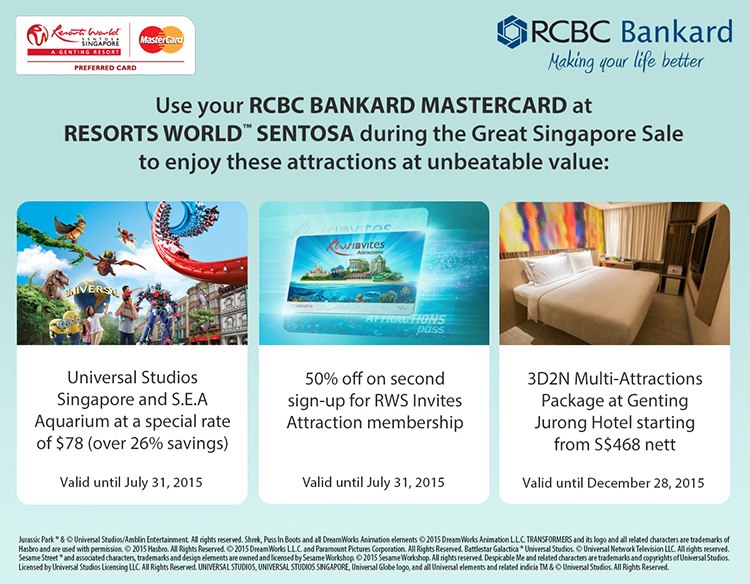 Enjoy access to two theme parks – Universal Studios Singapore and S.E.A. Aquarium at one special rate of S$78 (over 26% savings). 1. Promotion is valid for park visit from 1 Jun – 31 Jul 2015. Extension of validity is not permitted. 2. Promotion is valid for purchase of Adult regular One-Day dated Pass only, subject to availability. 3. Payment must be made with an RCBC Bankard MasterCard. 4. Promotion is valid for purchase onsite (at any ticket booth) and online at www.rwsentosa.com/mastercard. 5. Promotion is valid for purchase of up to six (6) packages per transaction. 6. Purchased tickets are non-refundable. 7. Tickets are subject to availability. 8. Promotion is not valid with any other discounts and promotions. 9. Resorts World Sentosa reserves the right to change the terms and conditions at any time without prior notice. Sign up now for membership to Resorts World Invites Attraction and enjoy 50% off on the second sign-up. With your membership, you get to relive spectacular experiences at RWS top attractions over and over again plus exclusive privileges all across the resort – Universal Studios Singapore™, S.E.A Aquarium™, Adventure Cove Waterpark™. 1. Promotion is valid for Adult, Child and Senior membership. 3. Sign up for Adult and enjoy 50% on Child/Senior. 4. Both RWSIA membership sign-up must be of the same attraction and within one transaction. 5. Payment must be made with an RCBC Bankard MasterCard. 6. Promotion is valid for park visit from 1 Jun – 31 Jul 2015 (to activate the membership within this selected date of visit). Extension of validity is not permitted. 7. 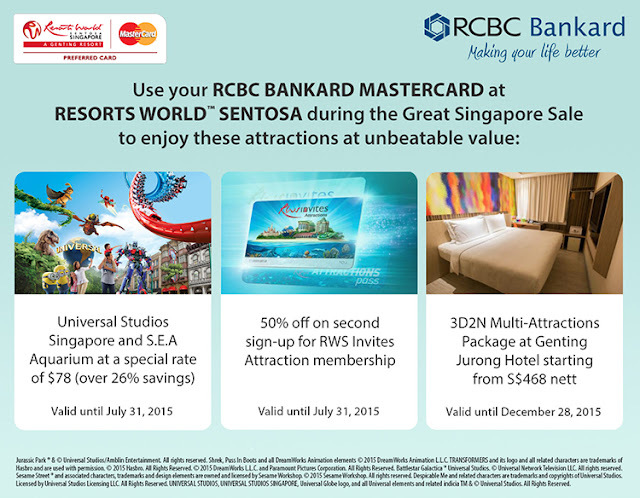 Promotion is valid for purchase onsite (at any ticket booth) and online at www.rwsentosa.com/mastercard. 1. This promotion is applicable for booking from now till 28 Dec 2015. Stay period is from 1 May till 30 Dec 2015. 2. Promotion rates may vary depending on selected stay dates, subject to changes without prior notice. Booking and stay period excludes Super Peak and Black-Out Dates. 4. Limited number of packages is available for reservation per day. Confirmation is subject to availability. 5. Rate is applicable for up to two (2) persons, on a per package basis and inclusive of 7% Government Tax and 10% Service Charge. 6. No refund will be made for cancellation of the booking and for any unused services included in the package. 7. Amendment of dates is not permitted after package is confirmed. 8. Not valid in conjunction with other promotional offers. 9. Rates are subject to change without prior notice. 10. Resorts World Sentosa reserves the right to amend or add to the Terms and Conditions at any time without prior notice. Book online at www.rwsentosa.com/mastercard and onsite ticketing booths for park attractions. Plus, convert all your online and travel expenses to 0% INSTALLMENT FOR 3 MONTHS by calling 888-1-888. Per DTI-FTEB SPD Permit No. 2648 Series of 2015. For issues that require immediate action, please call us at 888-1-888. Outside Metro Manila, you can call 1-800-10-888-1888 using PLDT NDD Access. Outside the country, you can call RCBC Bankard at +63 2 888 1 888. You may send your inquiry/feedback to service@rcbcbankard.com. Or completely fill-out Inquiry Form below.